On the surface, the standoff at Standing Rock, North Dakota, appears to be a clash between competing interests. Native Americans, bent on stopping the construction of an oil pipeline, are convinced that the project will destroy tribal lands and potentially contaminate their drinking water. Pipeline owners, with permits in hand, have plans to transport valuable oil supplies to an energy-hungry nation, believing they have every right to do so. The issue seems clear, and the just response to the unfolding conflict obvious to those watching. Of course, the resolution you see depends on where you stand. The U.S. is, after all, a country of laws. Texas-based Energy Transfer Partners (ETP) has proposed an 1172-mile long pipeline that, when completed, would deliver up to 570,000 barrels of crude oil each day from wells in the Bakken Shale of North Dakota to Illinois terminals. The oil would be refined for markets in the Gulf Coast, Midwest, and the East Coast. Proponents of the project believe increased domestic crude oil production translates into greater energy independence for the United States and will create thousands of jobs. They also believe that statistics show that pipelines are the safest mode of transporting crude oil. With the exception of federal lands near Lake Oahe, ETP currently owns or is in the process of acquiring rights to all of the property needed to construct the project. Because the pipeline would cross waters of the U.S. (including the Missouri River), ETP needed a permit from the U.S. Army Corps of Engineers, the federal agency responsible for regulating fill within wetlands and streams. 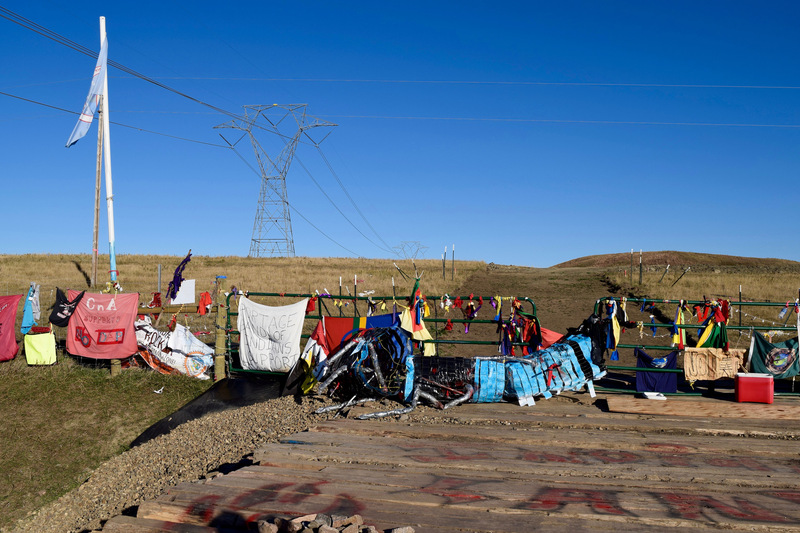 In reviewing the project, the Corps determined its jurisdiction was limited to individual crossings and where the pipeline would intersect federal property. Therefore, the work was authorized through a series of site-specific permits, without the need for an Environmental Impact Statement that would have addressed the entire pipeline route. Corps officials contend that the Tribe was given an opportunity to comment on the proposal. The occupation of private lands to stop the construction can, therefore, be seen as a violation of ETP’s property rights and an obstruction of a legal commercial activity. 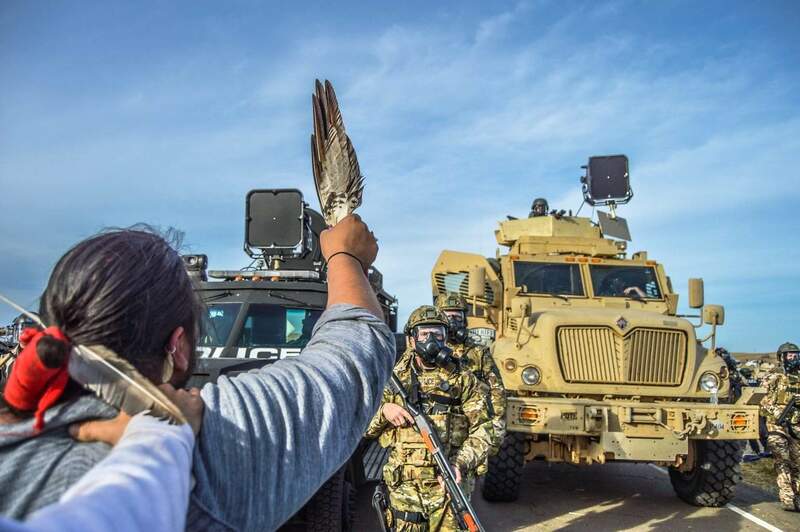 State and local law enforcement officials have met opposition by the Standing Rock Sioux and their supporters with increasing force and determination. This has resulted in over 400 arrests and even more assaults with clubs, mace, concussion grenades, and trained attack dogs. The U.S. is also a country of values and due process. From the perspective of the Standing Rock Sioux and their growing number of supporters, the Dakota Access Pipeline is an affront to Native American values; a desecration of land still held sacred by tribal culture; and a threat to the Missouri River, the primary source of their drinking water. The Native Americans at Standing Rock view their opposition to the pipeline construction as a defense of their land, water and sacred traditions. Constructing the pipeline requires disturbing a path up to 150 feet wide for nearly 1200 miles. This work would destroy native burial grounds, sacred sites, and other historically significant areas. While cultural resource surveys were supposedly conducted along the entire route, they were conducted by out-of-state archaeologists with little or no training in the cultural practices of the Tribe. The Standing Rock Sioux was not allowed the opportunity to discuss protocol for the surveys nor participate in them. In addition, by limiting its jurisdiction to individual crossings and federal lands, the Corps of Engineers’ environmental and cultural resources' review covered just 37 miles of the 1200-mile long pipeline route. It was under this narrow geographical scope, that the Corps made a determination of “No Historic Properties Affected”, and why the Standing Rock Sioux Tribe is challenging the U.S. Army Corps of Engineers in court for circumventing the full application of the National Historic Preservation Act. Section 106 of this Act requires federal agencies to take into account the affects of their undertakings on historic properties, and afford the Advisory Council on Historic Preservation a reasonable opportunity to comment. The Standing Rock Sioux Tribe also is raising concerns over the withdrawal of an alternative pipeline route that would have crossed the Missouri River upstream of Bismarck, the capital city of North Dakota. This alternative was rejected by the Corps because it is longer, more costly, and a potential threat to wells that provide Bismarck's drinking water. But the proposed route passes just a half-mile upstream from the water intakes for the Tribe. The Tribe is asking why the risk of a pipeline spill to the Standing Rock Indian Reservation is acceptable, while one to Bismarck is not? According to the Associated press, North Dakota recorded nearly 300 oil pipeline spills in less than two years. The river is the main source of drinking and irrigation water for the reservation and its 8,200 residents, 40 percent of whom live below the poverty level. The U.S. Environmental Protection Agency estimated that oil from a spill at that Missouri River crossing could reach the Tribe's drinking water intake at Fort Yates, within several hours. Entrance to Cannonball Ranch recently purchased by DAPL where archaelogical and burial sites were identified by the Tribe. Photo by Jacqueline Keeler, October 13, 2016. Flickr/cc. President Obama recently noted that the Corps of Engineers may be looking at alternatives that could address the concerns of the Tribe. Given the President’s input, most would expect that this dispute will be settled in a court of law and/or through administrative action, and Standing Rock will, once again, return to normal. But that also depends on where you stand, and what view you take. To fully understand the Standing Rock action, one must see it in the broad historical context of racism and oppression wrought upon the tribes of the Upper Missouri over the last 300 years. With the westward expansion of white European settlers, the U.S. government sought ways to accommodate the expansion of economic interests either through treaties or military force. Untold numbers of innocent “hostiles” were sacrificed in the process. Agreements such as the Fort Laramie Treaty of 1851 established Indian lands, but failed to understand the native culture and tribal relationships, leading to additional conflicts. Tribal lands of the Black Hills, once set aside for the Lakota people, were seized by the U.S. Government in 1877, largely to accommodate economic interests of those who sought the regions’s gold. Despite localized resistance by native peoples, the area quickly become one of the most densely-populated regions of the Dakota Territory. Even as their lands were reduced by broken and renegotiated treaties, Native Americans have remained in the area, maintaining a connection to their land, their ancestors, and their culture. The native culture, founded on principles affirming a relationship of all living things and the sharing of resources, is in direct conflict with European values of self-determination; property ownership; and manifest destiny. Although the culture and the American wilderness have largely been subdued, the clash of world views continues. The uprising at Standing Rock is far more than an isolated conflict of competing interests. Rather, it reflects the native people’s continuing battle with colonialism. The Tribe believes it is no coincidence the pipeline has been routed near their land. They know they must confront both the U.S. government and powerful economic interests in order to protect and preserve their land, water and sacred sites from pipeline construction, despite treaties that ostensibly were signed to give them tribal sovereignty. Our view from Standing Rock is central to how we see the principles of eco-justice. The protection and fair distribution of life-sustaining resources for all who depend on them is central to the indigenous culture. The U.S. Government needs to recognize the rights of the Standing Rock Tribe, and respond to their call to keep the Dakota Access Pipeline away from their reservation, water supply, and sacred sites. Our country has a long, sad history of using force against indigenous people. The militaristic force that has been unleashed on the Tribe and their supporters needs to immediately stop.